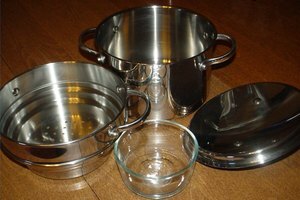 Dutch ovens and stock pots are two different types of cookware that serve two different purposes in cooking. Dutch ovens are heavier in construction and are historically known for use in camping. A stock pot was developed for even distribution of heat from the source and normally has straight sides. A stock pot is used for creating stock for soups as well as for cooking a larger quantity of soup. A stock pot has a flat bottom and straight sides. This helps the stock pot to heat evenly when placed directly over the heat source. Stock pots usually have a lid to help with retaining heat. Normally, the lid will allow for some evaporation of water during the cooking process. This helps to condense the flavors of the stock as it cooks. The Dutch oven is almost as old as the stock pot in its origins. A Dutch oven has sloping sides and is usually not as tall as a stock pot. They have tight fitting lids to help hold moisture in as well as thick walls to protect the contents. This allows them to be placed in a fire and to have coals placed on top for the actual cooking process. Dutch ovens were common among the wagon trains and in cowboy camps in the 1800s when America was being settled. They allowed the camp to bake bread or delicious stews over a campfire and are still used today with modern cooking appliances. Dutch ovens are the forerunner of today's crock-pot where evaporation is kept to a minimum during the cooking process. 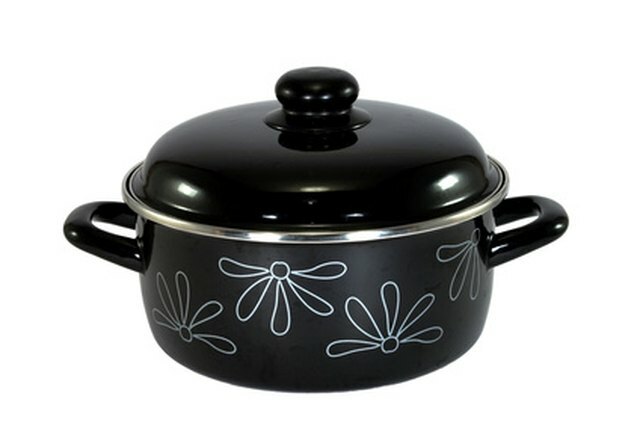 The stock pot is usually made of aluminum or other lightweight material with thin walls when compared to a Dutch oven. Combining a group of ingredients and allowing them to simmer in a liquid, normally water, was one of the first methods of cooking of mankind. Stock pots have been used throughout history to make the base stock for soups or stews and are a staple in the modern kitchen today. Dutch ovens are normally oval or round in shape. The tight-fitting lid keeps the contents safe from ashes when placed in the fire as well as keeping moisture from escaping. The most common Dutch oven is made from cast iron, ceramic, or glass, though glass Dutch ovens should not be used on a campfire. The thicker walls allow for an even distribution of heat, including from the top as well as the sloping sides. There are many similarities between a Dutch oven and a stock pot, yet each functions differently and provides different methods of cooking. While a Dutch oven can be placed on a stove top or over a fire, stock pots are rarely placed inside a heat source. The Dutch oven does not have the capacity for making a large quantity of food and is generally more expensive than a good quality stock pot.